Because there is much to see and do in Cinque Terre, Italy, you’ll want to plan enough time there. Literally translated as the ‘Five Lands’, the Cinque Terre is a colorful collection of five picturesque seaside villages located on the Italian Riviera. It is considered a UNESCO World Heritage Site and is widely famous among Italians and foreign tourists alike. Cinque Terre is famous for its hiking trails, as the entire region is covered with twisting paths that take you from one village to the next. The most popular hiking trail is known as the Sentiero Azzurro or the Blue Trail. You can start your hike in Riomaggiore, where the pathways are paved and easier going, and then work your way north toward Monterosso. Although, if you’re looking to avoid the crowds, take the Sentiero Rosso (the Red Trail) instead. It’s a much longer hike, but very doable if you take it in small sequences. While it is perfectly doable to hike through all five villages in one day, you should take your time, as the terrain can be quite demanding for beginners. Also, why hurry when the view is incredibly spectacular? You can experience a whole different view of this gorgeous region by hopping on a ferry that offers you a picturesque view of Cinque Terre’s beautiful seaside towns. There is one ferry that makes regular trips between four of the five villages, and also provides access to the nearby towns of La Spezia, Levanto, Portofino and Portovenere, as well as to the island of Palmaria. Especially for history buffs, the Museo delle Cinque Terre Antiche in Riomaggiore is a must visit. This small museum, which is housed in an old restored wine cellar, takes you through the local traditions, regional agriculture, and the long history of this ancient region. In addition, everybody who visits Cinque Terre raves about the food, and for good reason! It is simple, fresh, and delicious. Anchovies are a local staple in Cinque Terre, and you’ll find them in antipasti, on top of pizzas, or fried up as an appetizer. Fresh basil pesto is another local specialty. In fact, the origins of this dish can be traced back to Liguria. For a really special treat, try the region’s light brown pasta called ‘trofie’ made from wheat or chestnut flour, with a fresh pesto genovese. And if you happen to find yourself hungry in Corniglia, make your way to Miele di Corniglia — a delicious creamy gelato made with local honey. Women traveling together will find that most of the best days they’ll ever spend in Cinque Terre always have good food in the picture. The Tuscan region is teeming with local wine and beautiful vineyards, and Cinque Terre is no exception. On a hot afternoon, the crisp white Cinque Terre wine makes for a perfect choice. Women traveling together should definitely sign up for one of the many wine tasting tours in Cinque Terre, Italy. The terraced vineyards are lovely, and the local wines are incredible. 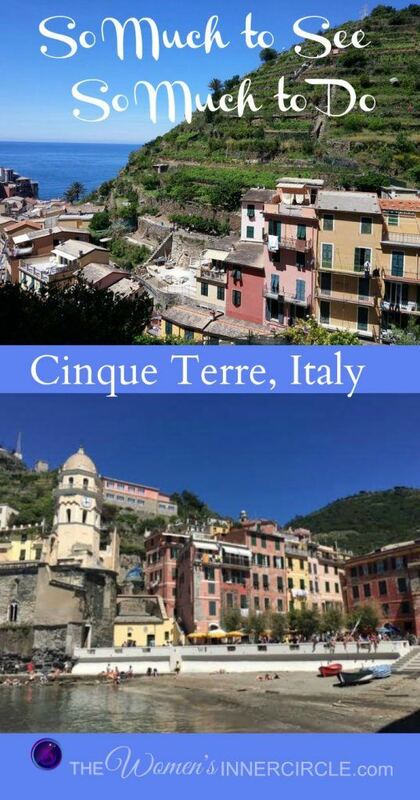 Buy a Cinque Terre, Italy card. This allows you unlimited access to all five villages on train and trails. Bring good, comfortable shoes for this area. Especially for women traveling together, stilettos shouldn’t be an option. Try to fit in a day trip to Santa Margherita Ligure, Portofino or Portovenere. Visit in July or August, as it can get too stifling and crowded. Arrive without a room reservation. Worry too much about picking the right town to settle down in. All, except Corniglia, are within a few minutes train ride of each other. Hopefully, you can see why you’d want to include Cinque Terre, Italy in your travel plans.